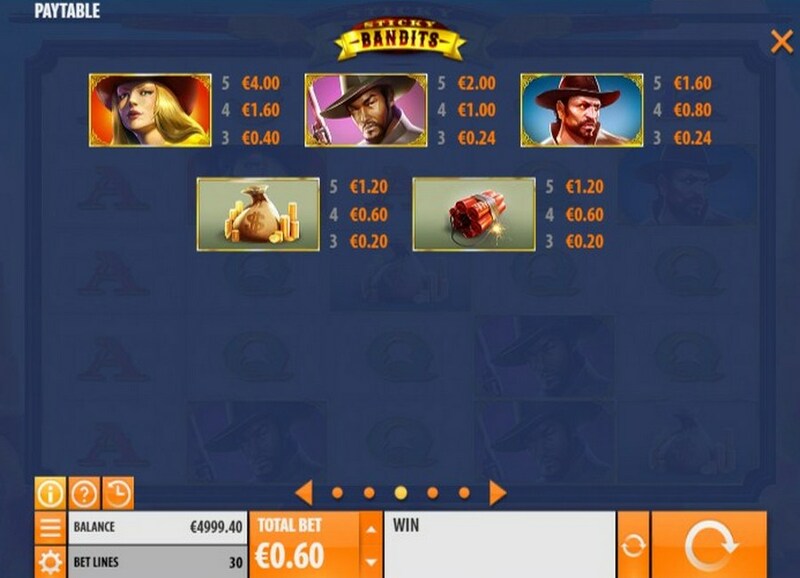 Whether you are looking for free spins or bonus features then slot machine game Sticky Bandits by casino software developer Quickspin, with it’s cowboy villains that are both massive and sticky, then you are going to be in for a treat. You can pay to play and the game will be available in most online casinos, or why not play Sticky Bandits for free as a demo just to get the hang of things. Plunge into the cacti-strewn canyons of the Wild West with the Sticky Bandits, as they attempt to rob the runaway train in our latest release. It’s a thrill-a-minute rollercoaster of ride featuring dodgy desperadoes, dynamite, and a killer spaghetti western soundtrack for all you cowboys and cowgirls out there. 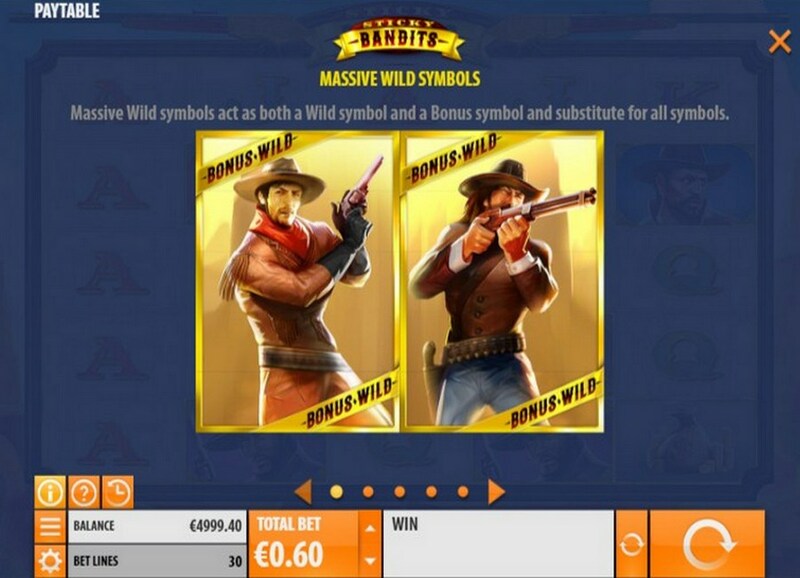 The 5×5 slot features massive wild symbols of the train heist villains, with the bonus symbol and any wild symbol triggering the free spin bonus. Massive Wild symbols appear on reels 2 and 4, covering adjacent reel positions to the right. Massive Wild symbols act as both a Wild symbol and a Bonus symbol and substitute for all symbols. Seven Free Spins are triggered when a Bonus symbol appears anywhere on reel 1 and a Wild symbol appears on reels 2 or 4. Positions that are wild when the bonus is triggered will remain wild for the duration of the bonus. 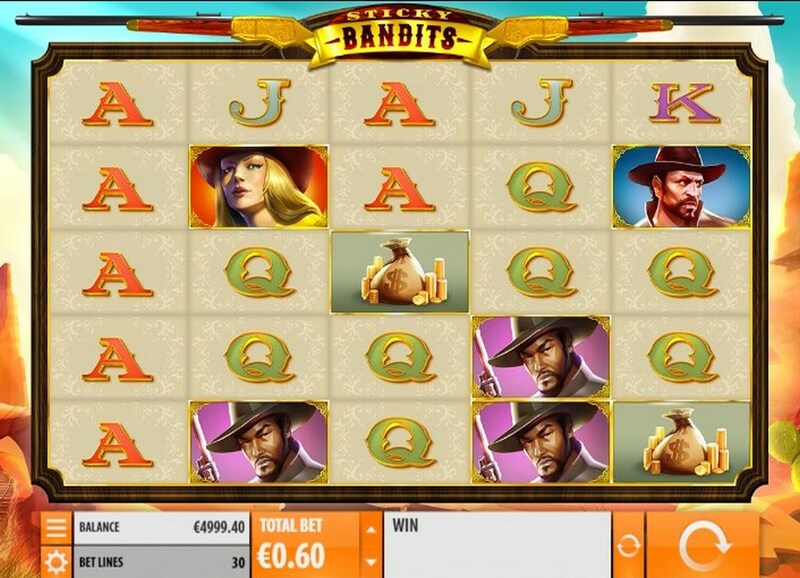 Overall, Sticky Bandits is an another superb offering from Quickspin which is surely going to rival the other popular slot machine games.